Today's date 12 December 2012, which people make it short as 12-12-12. Today has a very nice date combination. Even better if my fish Purpy is here now. 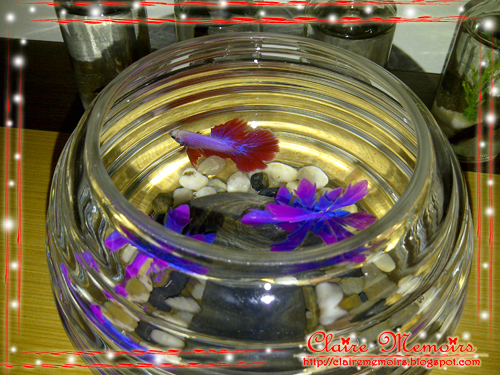 Last night, I browsed the internet and read some articles about Betta fish. 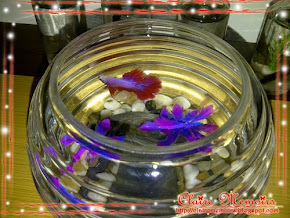 One statement says that if betta fish makes bubbles, that means they are happy, happy with the environment and with the owner. This reminds me about Purpy who made a lot of bubbles when he got his new tank with me. 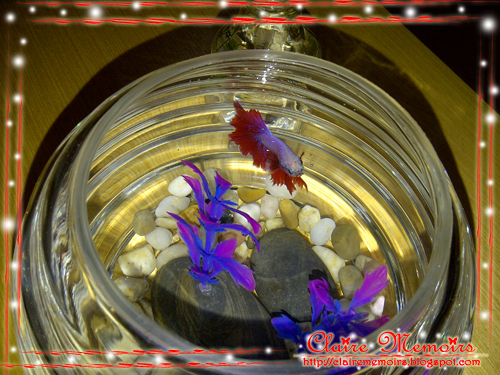 That time I never knew that when a betta fish makes bubbles implies that they are happy. Now I know this and this really makes me regret. I am regret to know this too late for him. But another side in me, I am glad that Purpy ever be happy with me. "Thanks for the bubbles, Purpy". I still miss him so much. His empty tank struck my heart, feel so empty just like the tank. I still don't know what to do with the empty tank until this minute. 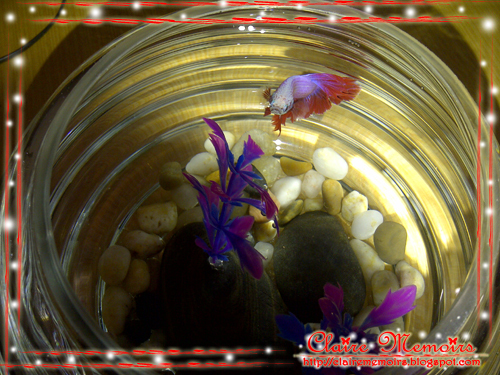 He is my Purpy, a male betta fish with red + pink + a bit purple in color, and wide tails. 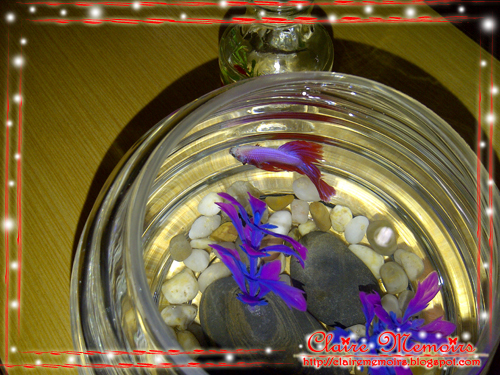 On 6 October 2012, I got him from a fish seller. I knew he loves boiled prawn from the seller, cz he always get the boiled prawn slice as his food. I changed the water regularly. I put plastic purple plant inside his tank. But one day, I saw his tail got a bit of broken part because of the plastic plant. So I decided to removed it to ensure his safety. He became kinda inactive, not really swimming around like what he always did normally. But honestly I didn't know the reason. Is it because I removed the plant? or any other reason? About one week after the plant removal, He was getting inactive. And he had lost his appetite too. I feed him the prawn but he stopped eating. So I tried to give him common fish food and exactly the same result, he won't eat. Another week passed, his color is getting pale and he is getting weaker. This made me sad. I wished he can be healthy back like before. Saturday, 8 December 2012, I went to my sister's place and stay over night there. But before I went out, I add a drop of anti-whitespot liquid into his tank. I know he is already so weak cz he didn't really eat for 1-2 weeks. Sunday, 9 December 2012 around 10pm. I came home to check my Purpy. I found that he has left me. Purpy left me and 4 other bettas. I didn't know what happen to him actually but I'm sorry that I can't take good care of him. 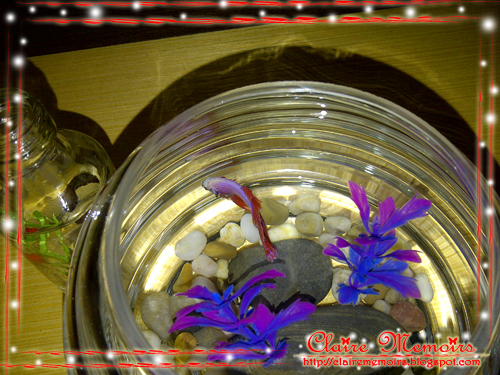 I still miss you, Fish Fish Purpy. At around 9.30am we reached Poring Hot Spring @ Ranau. 5.40am wake up time..... The first thing I do was taking some pictures of the morning scenery from my room's window. I love the fresh morning air.... the breeze.... It was really great over there....... Looking down the hill and enjoying the green vegetables' farm. All I can say is.... IT WAS SO SO SO GREAT. Done taking pictures.....then get ready for the breakfast @ Cottage Hotel.... I was having Fried Rice Noodle (Char Kueh Tiaw), some Baked Beans and Sausages, and 2 pcs of steamed egg. I called it as steamed egg because I don't see any "fried mark" on the egg XD. OK.... breakfast is done and energy is fully charged..... now we are on the way to Ranau. Half way to Ranau...there is local market selling some local fruits, veggies, and some plants too. I saw these bottles and I was wondering what's this actually. The seller told me that this is HONEY, white honey, light brown honey, and dark brown honey. I totally got no idea about the difference between them. I only saw one type of color before, the Light brown honey. And the pic below.... this is their LOCAL APPLES. It was my first time knowing and seeing this kind of fruit. Almost the same shape with pumpkin. Another type of fruit, LOCAL AVOCADO, which is also my first time knowing and seeing this fruit. Hardly can describe the taste of local apple by words. What I know... it is a bit sweet, kinda soft, smells like soursop. Good taste.